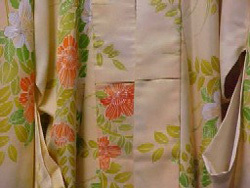 Kimono (pronounced kee-mo-no), when translated means literally 'things to wear' (clothing). 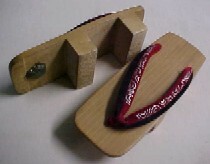 In 2006, Mrs Mitsue Stockley, resident of Wagga Wagga since the 1950s donated a kimono and full set of associated accessories - including obi (sash), tabi (socks), geta (sandals) - and other items to the Museum of the Riverina. Mitsue was an eleven year old living in Hiroshima when the Americans dropped the atomic bomb that was to end World War II. More than 100,000 Japanese died instantly in the aftermath, including Mitsue's eldest sister, Aunty, Uncle, cousins and friends. Life changed for Mitsue, when, in the early 1950s, she met Roy Stockley - a young Australian serving with the occupational forces in Korea. Becoming friends, and eventually falling in love, they were married in Japan approximately two years later. In 1954, Mitsue was one of eleven Japanese brides who sailed to Sydney to begin a new life far from their families, in an alien country. Used to the large bustling cities of Japan, Mitsue's first impression of Wagga Wagga was that it was a 'ghost town'. Her early years in Wagga were not always easy, with racism and intolerance often directed towards her and her two sons. Mitsue became an Australian citizen in 1958 and became a well-known identity in Wagga. 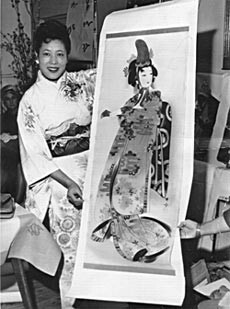 She became an unofficial Japanese cultural ambassador to groups such as the CWA (Country Womens' Association), the Girl Guides, the WEA (Workers' Educational Association), the Wagga Wagga International Club and the Wagga Wagga School of Arts. Mitsue also held many jobs in Wagga - including working in the kitchens of Calvary Hospital, as a beautician and as a shop assistant in Edmondson's and Best & Less. Today, Mitsue is also remembered for hosting a popular Japanese cooking programme on RVN2 (now Prime) during its early years. 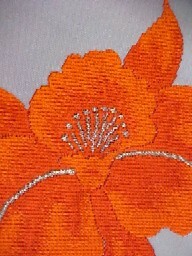 Mitsue's kimono (and other items within this collection) gave her a precious link with Japan, whilst surely evoking memories of the homeland, family and friends she left behind for love in 1954. These objects were also tools which she used to successfully gain acceptance, friendship, love and understanding within her new community.